Must have developed a windows phone apps. There is only one foreground application active at a time though other may be running but are not active. This ensures better battery life for the user. 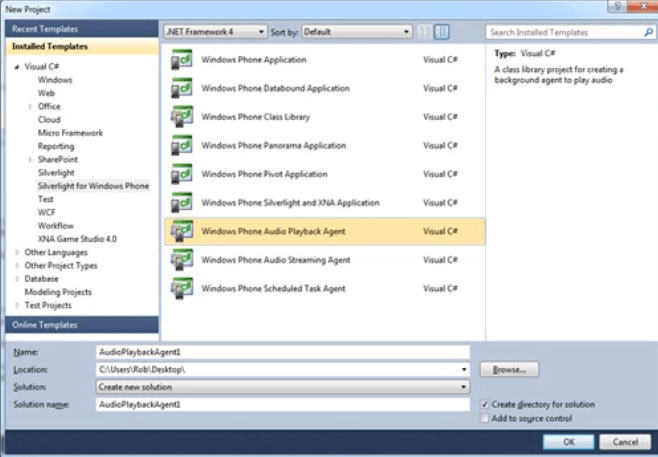 A Windows Phone application can have only one background agent which can perform perodic tasks or resource intensive tasks or both. The Agent can run when the application is not in the foreground. The background tasks have limitations to what it can do and processor and other phone facilities. The logical reason that microsoft architect give is that if a background tasks goes out of control or does what it is not intended to do somehow it should not affect the battery life of the phone and the user user experience as well. A background task can be used used to conatc the datbase and get the updates every half an hour or play music from a server online. There can only be limited number of background agents running at a point of time and this controlled by the oprating system. A background agent will be started only when the operating system can give the agent processor resource. If the phone goes to power saver mode then the background agents may stop running. Also at any point of time the user can see the background tasks running and can manage them and choose to disable them. So dont put any critical logic in background agent as it may not run. Its like icing on cake. The Agent is the container that is manged by the operating system and agent is the code that will run. Will run every now and then (typicallyevery 30 minutes or so). Phone will have of limit on how many of them can be running. Good for location tracking tracking and polling background services. So if you rellay need this to run you need to made some recomendations to the user so that this resource intensive task runs successfully. A Resource intensive agent can run upto 10 minutes. Good for synchronization with host service, unpacking / preparing services, compressing database. An application can run both periodic and resource intensive tasks. Can be achived though single background agent class. When the agent start it can determine in which context it is running and behave appropriatly. 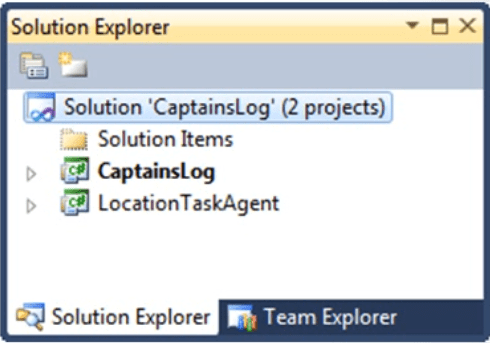 Lets Create a captians log application which will be a simple logging application. Users can type log entries which are timestamped and stored in an isolated storage. The tracking feature will be added using background agent. The start tracking button click will fire up the background agent will be track the location of the captain and add it to the log. So the agent will update the position even when the program is not active. 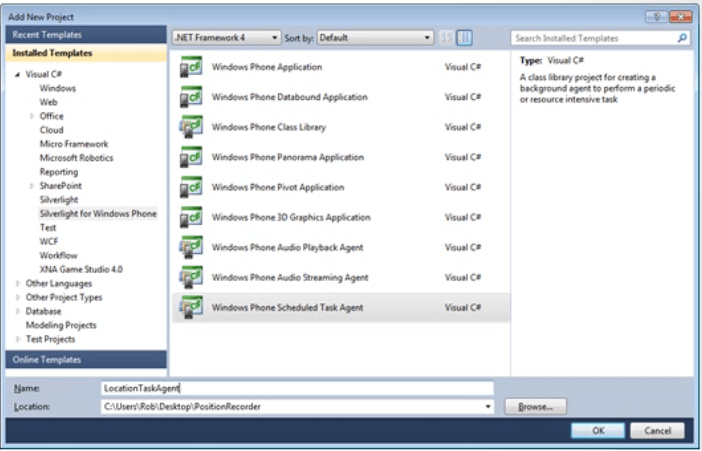 Create a Windows Phone application solution and develop the foreground tasks and applications. 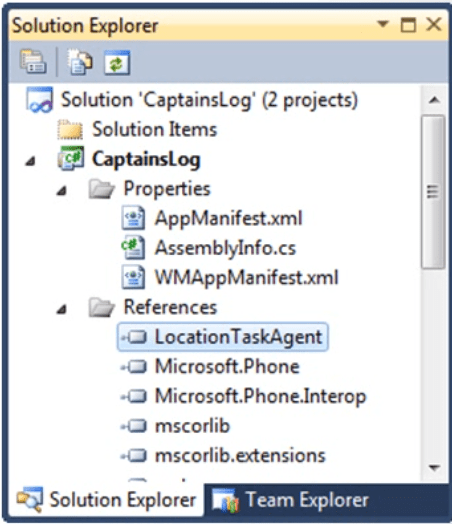 Add a new project to the application solution which is Windows Phone Scheduled task (VS Template). This will contain code will run when the agent is active. 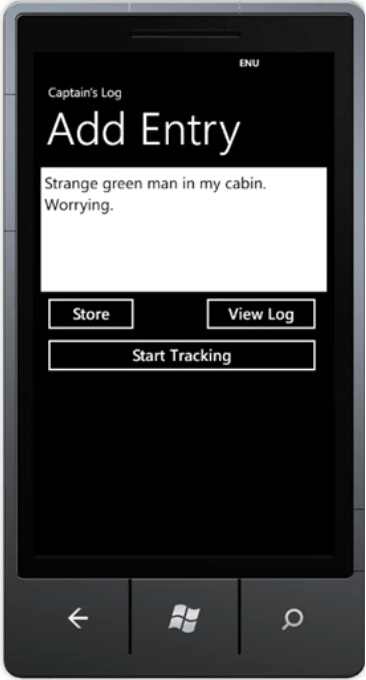 Captians Log – The Windows Phone Silverlight Project which is the main application. LocationTaskAgent – The background agent to perform the tracking. Solutions may contain differnt projects and when the soltion is build all the assembly file outputs will be combined and sent to the phone. And when we do this the application manifest file adds a little bit of text to hold the description of the background agent and this is how the background agent is bound to the application. Here is the text added to the application manifest file. So below is the code that will run when the agent wakes up so we need fill this OnInvoke method with our code that the agent will run. At the end to this code we need to call the method notify complete whcih will will notify the runtime system that it is done. The Captains log datafile is shared between the application and agent and the first thing that the agent will do is load this datafile from the isolated storage. Now we make use of GPS traking to find out the current loaction. So we make GeoCoordinateWatcher and start it and use it to get the location. Now before you start thinking about the performance hit this does i would like to tell you that there is a special version of this class provided for Background Agents which uses cached location data which is stored every 15 minutes. And then agent just stores back this location to the application and goes to sleep. Finally a notification is displayed to the user on which the user can click and go to the main application. It is possible to create a background task to transfer files to and from application’s isolated storage. The transfer will take place when the application is not running. The system maintains a queue of active transfers and services each one in turn. Applications can query the state of active transfers. These can be modified by settng the value of TransferPreferences on a particular File Transfer. Most instertingly you dont need to create additional projects to manage background transfers. The following code creates a request and sets the source for transfer and it also sets the transfer method. The following code sets the destination of the files transfer which is isolated storage of the application. Also it sets the preferences for the transfer. Now the transfer preferences can have multiple string so that you can set multiple properties. The following code starts the transfer request by adding it to the list of active transfers. Also catches the exception if any and shows a message if it cannot proceed with the transfer. The following code monitors the transfer by binding the methods to the events fired by the transfer request. Windows phone appplication at any point of time can find out how many active transfers does have and as a rule of thumb you should always check the same whenever your application restarts because your transfers are still running when your application is not active. Below is the code that lets you do the same. 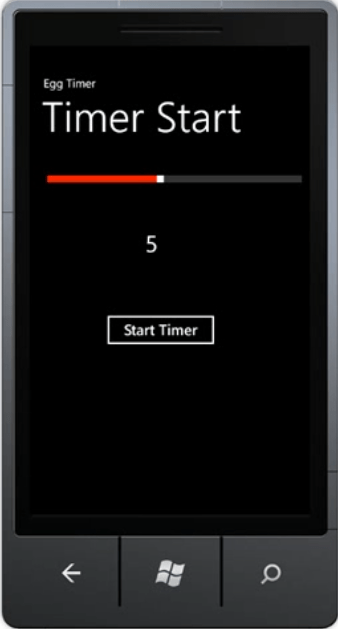 Windows phone app can create scheduled notifications and they are displayed when the application is running or not. When the notification is diplayed the phone user has the option to respond to it or not. Also the notification can be liked to an application page. The notifications can fire once or repeatedly at configurable intervals. The notifications is maintained by phone operating system, once the application can started then it doen not have to do anything. Lets make a simple timer application which will have two silverlight pages. The user will set the time using the slider then preses the start timer button to create a notification. When the notification will fire the 2nd page of the application which is egg ready page will be displayed and if the user clicks on the same then user will be taken to the application. The code for the creating the reminder is as below. This code will create the reminder and then adds it as a sceduled service. The value eggTime holds the lenght of the delay and this code also sets the url of the page in application. It is possible to create a playback that will manage an application playlist and the mechanism is the same as for other background tasks. The audio can be streamed or stored in application’s isolated storage. This would also work pretty much like the things shown above in the post so i am not elaborating it.